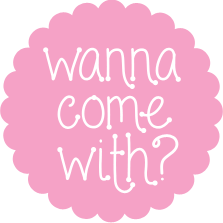 Honey Almond Nougat | wanna come with? I was at the Farmer’s Market a couple weeks ago and there was a woman selling homemade nougat. And I realized that the only time I’ve ever had nougat has been in candy bars. Cheap, mass-produced candy bars. I feel like I’ve been missing out here. I had a look both online and in my books and read up on making nougat. 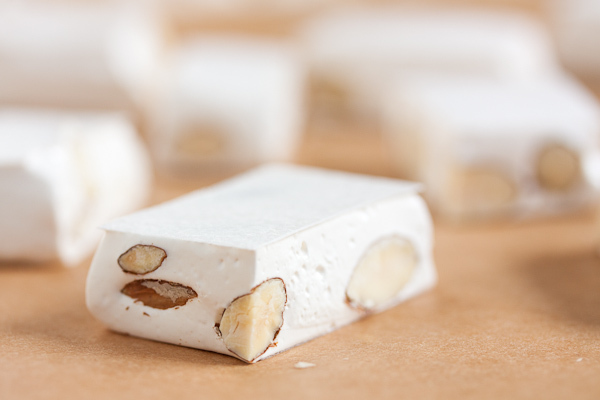 While there are a lot of variations – different flavours, different additions – most of the basic white nougat (Italian Torrone) recipes I found are very similar with a few minor differences. Some call for the honey and sugar to be heated separately, some together. Some call for the sugar to be added to the eggs when they’ve reached soft peak, some when they’ve reached firm. And some call for butter or cocoa butter to be added at the end, while some skip that step entirely. 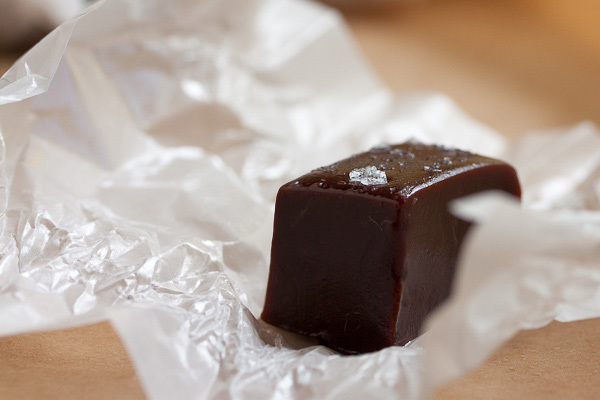 The recipe I chose to work with this time is from Anita Chu’s Field Guide to Candy. I have no idea what makes a good nougat, but I’ve had good luck with her recipes in the past and the recipe seemed straightforward. If you’re not familiar with Anita, check out her blog. Seriously. I’m always nervous when I try recipes like this for the first time – there are several components that are prepared separately and then combined with what seems like critical timing. The pressure! And the recipes always make it sound so simple, like the second the eggs are at soft peak, the honey will just be coming to a gentle boil. And as soon as that’s incorporated? Oh look, the sugar has reached temperature and is ready to be added too. That doesn’t actually happen. In reality, the honey came to a boil long before the eggs had finished whipping, so I turned down the heat and let it simmer until the eggs were ready. And then when that was done, the sugar was nowhere near temperature, so I just turned off the mixer so the eggs didn’t overbeat and let them sit until the sugar had finished heating. Other than those timing issues, everything seemed to come together fine. 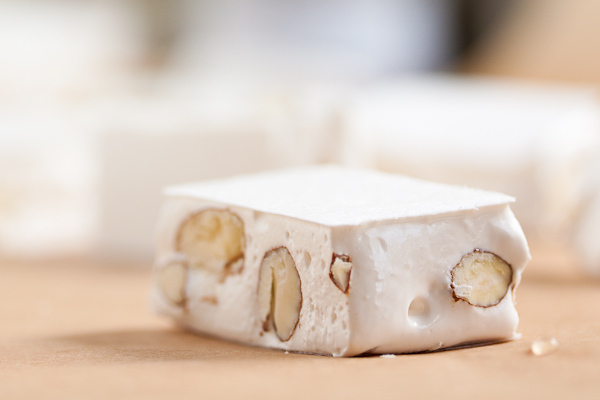 Nougat is incredibly sticky, and lining the pan and topping the nougat with wafer paper (also called edible rice paper, even though it’s made from potato starch) makes it easier to work with. 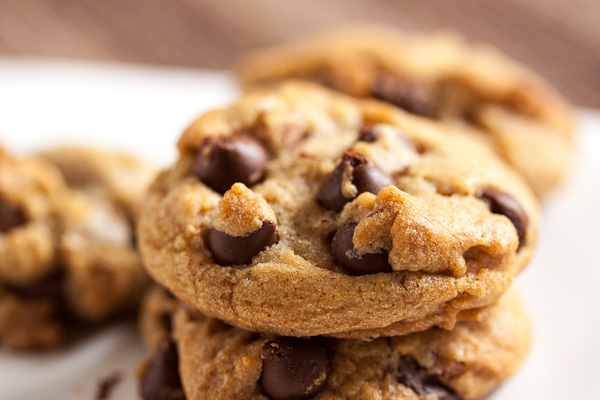 If you can’t track it down, you can just use well-oiled parchment paper. What I ended up with is soft, pliable, incredibly sticky and chewy, but firm enough to hold its shape when cut. It lost a lot of its volume when I added the butter at the end (I’m not sure if that’s normal or not). Based on photos, I suspect it’s a bit flatter than it should be. The humidity is also really high in Vancouver right now, which doesn’t do sugar any favours. This nougat has a really nice honey-almond flavour. Toasting the almonds really intensified their flavour, so don’t skip that step. Even though I’m not a big fan of sugary things, I keep nibbling on this (oops). Worst thing about making nougat? How sticky it is? How difficult it is to cut because it’s so sticky? Did I mention stickiness? Maybe the diabetic coma I can feel myself slipping into because I keep eating the end bits? But yeah, I’ll definitely make this again. I’d like to try some different recipes and variations for sure. I have a couple recipes for chocolate torrone that sound really good. Adapted from Anita Chu's Field Guide to Candy. Makes one 9" x 13" pan. Note: when cooking sugar, subtract 2°F from the target temperature for every 1000 ft above sea level. To toast the almonds, heat oven to 350°F. Spread in a single layer on a baking sheet and toast for approximately 15-20 minutes, turning the almonds every 5 minutes or so to cook evenly. Turn off the heat and keep them in the warm oven until ready to add to the nougat (it's best to add them warm rather than cool). Prepare a 9" x 13" pan with either a single layer of wafer paper or well-oiled parchment paper – fold it so both the bottom and sides are covered. Pour the honey into a small saucepan and bring to a boil. Combine the sugar, corn syrup and salt in another small saucepan and heat over medium heat until all the sugar is melted. Attach your sugar thermometer to the pot, bring to a boil and continue to cook until the sugar reaches 300°F. Based on how long the different stages took me to reach, I think it's safe to start whipping the eggs when the sugar mixture has reached approximately 240°F. 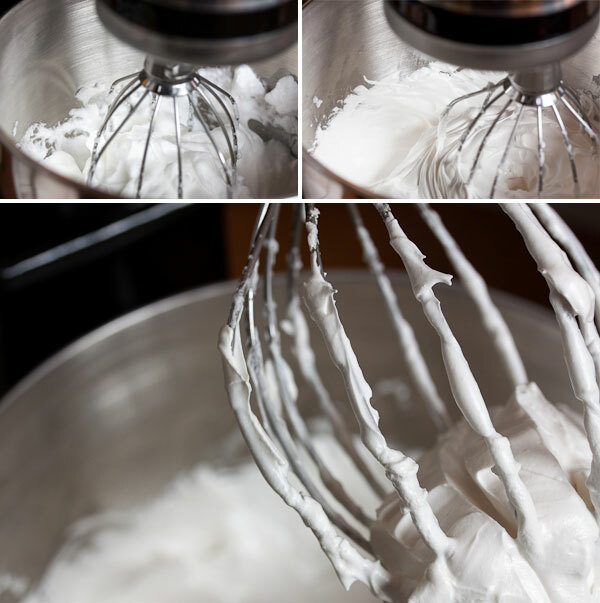 Place the egg whites in the bowl of a stand mixer fitted with the whisk attachment. Beat on high speed until soft peaks are formed. Turn the mixer down to about medium and slowly add the heated honey by pouring in a thin stream down the side of the bowl. Return the mixer to high speed and continue to beat until stiff peaks form. Turn the mixer down to medium again and add the sugar syrup using the same method – pouring in a thin stream down the side of the bowl. Be careful as it is very hot. Return the mixer to high speed and continue to beat for about 5 minutes more – until the mixture is glossy and stiff. Add the vanilla and butter. The mixture will fall apart at this point, but keep mixing and it will come back together. I found it lost about half its volume after adding the butter (is that normal?). Turn off the mixer and stir in the toasted nuts with a spatula. Pour into your prepared pan and smooth the top as well as you can – the mixture will be very stiff and sticky and tough to work with. 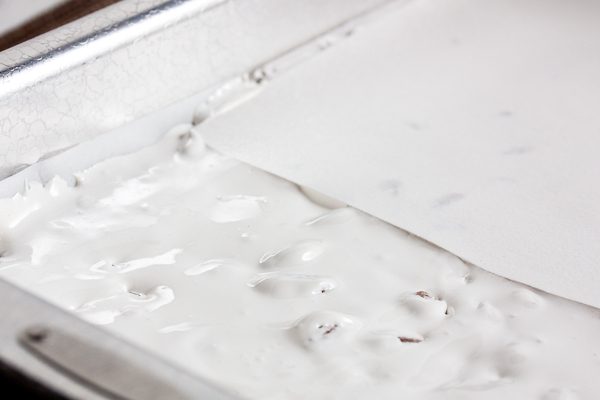 Top the nougat with additional sheets of wafer paper or another sheet of oiled parchment paper. You can use a rolling pin to smooth out the top at this point if you like, but I just smoothed it down with my hands. Since this is the first time making it, and the first time working with wafer paper, I opted to only partially cover the top to see what the difference is. I don't notice any difference in texture (the rice paper literally melts in your mouth), but the nougat with the paper both on top and bottom is much easier to handle when cutting. If you can track down wafer paper? Use it. Allow it to sit overnight before turning it out of the pan and cutting into squares with a lightly oiled knife. I found it really helpful to rinse the knife off whenever it got sticky. 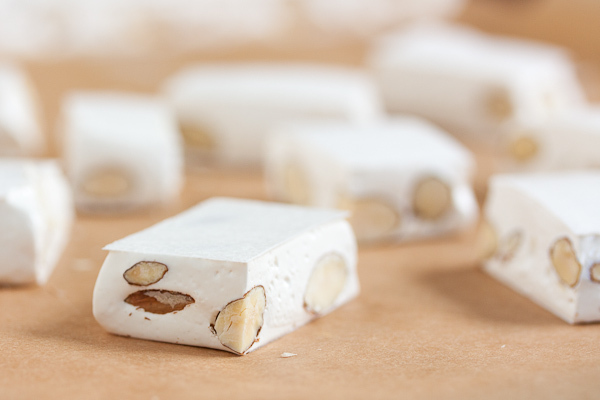 Wrap the nougat pieces in wax paper or cellophane squares. I think I’ll be adding this to my holiday repertoire too – pistachios and dried cranberries would be so pretty in this, don’t you think? You’re making me crave nougat! It’s one of those candies that’s not decadent enough for me to make regularly (call me, truffles) but when it’s done well, I absolutely love it. And making nougat in the humidity is a huge accomplishment! Mmmmm, I’m with you there on the truffles. I need to get back into making those more often, but things like caramels and marshmallows just seem so much more straightforward. Tempering chocolate always seems like such a huge amount of work until I actually do it and am surprised by how little time it actually takes. And here in Vancouver, if I were to wait for a low humidity day to do sugar work, I’d never get any done – all I can do is cross my fingers and hope for the best! 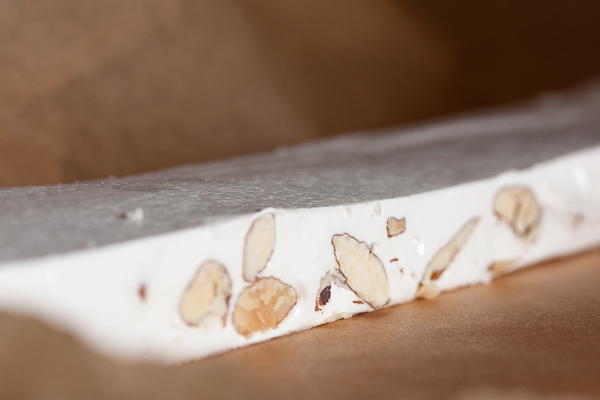 You really did an excellent job on this nougat and the photos. I’ve been having issues with Pinterest too since their latest update. And thank you so much, both for sharing and for the sweet comments! Congratulations! You now have as much experience with nougat as I do. 😉 I’m not sure whether there’s anything specific that could cause your nougat to go melty, or if it’s just a sugar thing. Sorry I can’t help you with that one. If you find out, though, please post back in case anyone else has the same issue. Wow! I was wondering if I could make torrone at home and reading your blog answered that for me. My brother lives in Spain and when we visit him we always bring back a few boxes of torrone and although I am not a candy fan myself I always end up eating it cause I like the toasted almonds. If only I could get my hands on some wafer papers here in Greece in time for the holidays (I either want to do something the “proper” way or not at all. Sometimes I look @ all the fancy stuff on other blogs and wonder if I should do more of that, but what I’m baking and posting is the stuff that I really love to do. Have you looked at egullet.org? It’s a great community and I got some advice there about making torrone. One person said that he learned in pastry school to just toss them with powdered sugar (like I did with my marshmallows) instead of using the wafer paper. I might try that method next time I make it. Hi Dilshaad – I wouldn’t try it, personally. 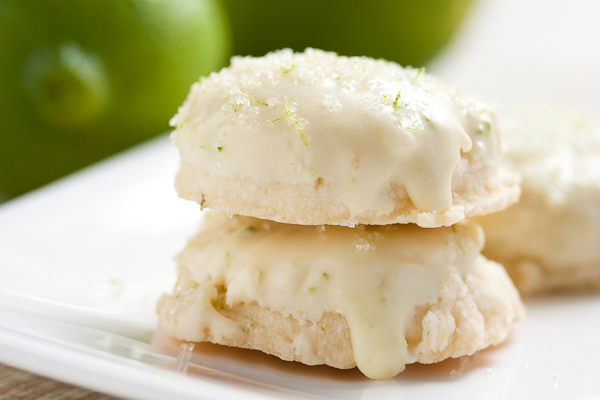 It would drastically change both the texture and flavour of the finished product. It would take some experimenting to get something that would be tasty. I’m sure there are other recipes out there that are already low sugar. Hi, thanks so much for all this advice. Love nougat because it’s normally gluten and dairy free. Is there an alternative to corn syrup which we dont have here? We have something called golden syrup here in Australia which is made from cane sugar. Would that do the same job? Hi Josephine – sorry for the late reply! I’m not sure if Golden Syrup would work or not. The reason for the corn syrup is that it’s a glucose, which helps to prevent the sugar from recrystallizing. If you can track down glucose syrup that would be ideal. Otherwise, you could TRY the golden syrup? Sorry, I know that’s not a huge help. Good luck!